Home » IT/Software Jobs » Accenture Offcampus Drive for Freshers Batch "Associate Software Engineer" for B.E/BTech/MCA graduates ! 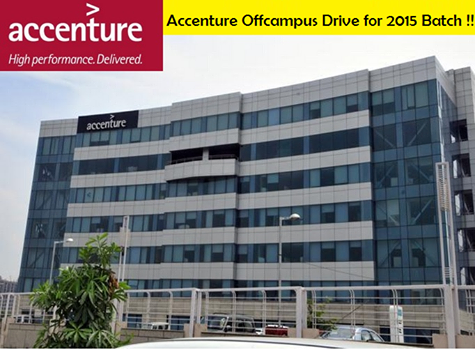 Accenture Offcampus Drive for Freshers Batch "Associate Software Engineer" for B.E/BTech/MCA graduates ! Are you searching for accenture company jobs? Accenture is hiring for freshers and experienced candidates. Want to apply for it? Now check it below. Accenture is a global management consulting, technology services and outsourcing company, with more than 305,000 people serving clients in more than 120 countries. Combining unparalleled experience, comprehensive capabilities across all industries and business functions, and extensive research on the world’s most successful companies, Accenture collaborates with clients to help them become high­performance businesses and governments. The company generated net revenues of US$30.0 billion for the fiscal year ended Aug. 31, 2014.
nationals are allowed to work in India without a need for obtaining a Visa to work.